Couple years ago, my brother made a comment about people using food as entertainment. In a way he is right. People have Summer BBQ’S with family or the whole neighborhood, coworkers will go out together on lunch breaks, and friends meet for dinner on weekends. Food is probably the 2nd biggest bill (assuming housing is 1st) every month for most people. Grocery shopping, drive-thru windows at some random fast food place, countless snacks from the gas station or snack machines at work is where a lot of people spend their money. Even here at Mt Rushmore, we get $140 taken out of our paychecks for meals (whether we eat or not), but most of my coworkers still pay money to go out at night to eat. For some reason food seems to be more enjoyable if you go out with other people to eat it. A couple places charge a cover fee to even get a seat, then you’re expected to tip, on top of paying for the meal and drinks. You could end up paying anywhere between $15-$45 for a meal. This is a picture of a lunch I had last week, at work. 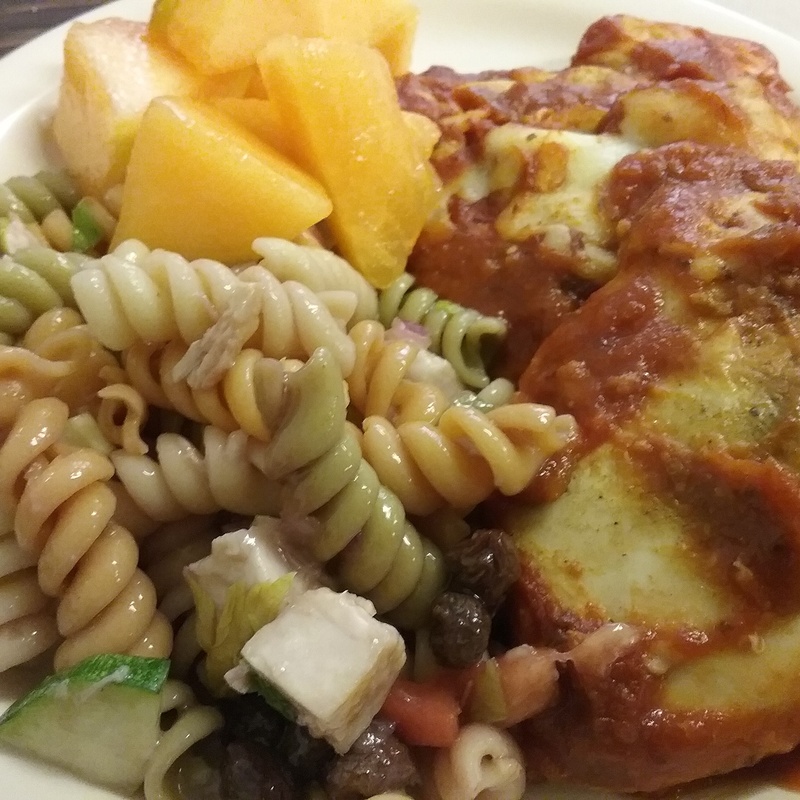 Chicken, pasta salad & cantaloupe. It filled me up enough so that I saw no reason to go out and pay for another meal. 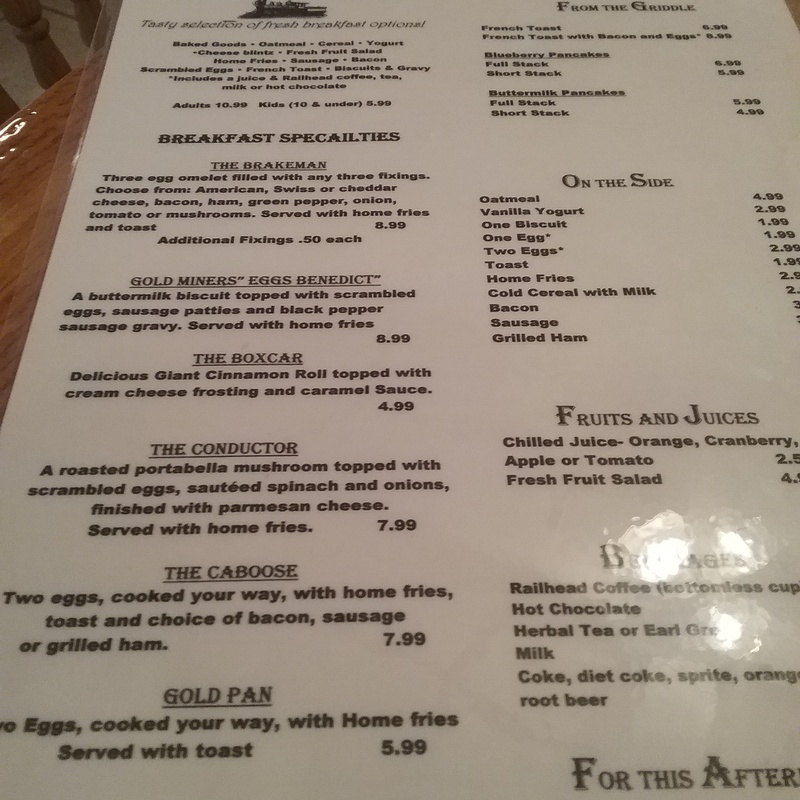 I did allow myself to go out for breakfast before going on a train ride last week though..picture above is part of the menu. The buffet was $10.99. Well I should go get ready for lunch soon. It’s Friday, so I know we get ice cream for dessert.